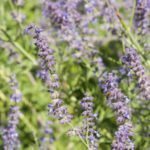 I want to remove an over grown Russian sage garden. I cut them to ground level and tried to remove the roots. That’s impossible. Should I till the area and then use root killer?? Tilling the area will definitely help grind up stubborn roots. If the patch is small enough, then the best solution will be to pour boiling water over the area where the roots are. This will kill them immediately without making the soil toxic, so you can replant immediately. If you till, you will chop the roots into bits and each piece will try to regrow. If you hit these new sprouts with herbicide, it will kill them. But what about the deeper roots? These go down deeper than tillers and are the biggest, most durable roots. Remove what you can then treat or hoe emerging leaves weekly until the roots are exhausted. I am wrestling with the same issue on a former Japanese anemone spot. There is no easy or quick fix.